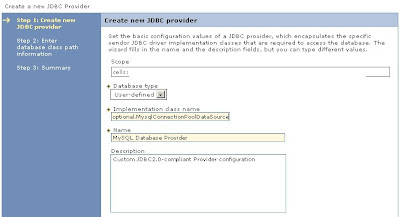 WebSphere doesnt have a template for connections to MySQL-Databases. Finish the creation in Step 3 (Summary) with "Finish". Finish the creation in Step 3 with "Finish"
password = "database user password"
serverName = "database server name/ip"
databaseName = "name of database"
Save and synchronize to finish the setup. exlent,, thanks for giving this material. But one thing what about connection pool. how many types . difference between these.